The minute you see it, you know it's a modern bathroom. Modernists tended to emphasize the cantilever. The farther a section of the house extended into space, the better. To that post World War II crowd, the cantilever signified progress, calling up visions of forward movement, spacecraft, lightness, freedom. High Modern here. Not only do we wall-mount the bathroom counter, but we wall-mount the toilet That wall toilet: space-saver in a small bathroom, but unnecessary in a large bathroom, such as this one. What are those two silvery glints below the counter? Answer: the sinks' J-traps. All of that water has to go somewhere, and it must move downward through plumbing pipes and down the sewer and away. With these "wafer-style" wall-mount bathroom counters, you cannot escape the reality of plumbing below the counter. It's only when you begin mounting larger vanities that you can hide the J-traps. You'll see this later. Once again, this is the classic modern "wafer-style" wall-mount bathroom counter that aims to be nothing less than a Spartan white shelf sticking out from the wall...into space. All of that dark-gray square bathroom tile is there on purpose: to highlight that glowing white counter. You could say the counter is the star of that bathroom show. The vessel sink means you don't have an in-counter sink (that's the conventional kind) jutting out through the bottom. The only thing that's difficult to hide is that plumbing pipe on the bottom. But later, we'll see some attempts to do just so. Now, here's a different style of a wall-mount counter. We've left the stark modern style and entered into a friendlier, more natural-feeling Asian-style bathroom. This counter has two "wings" that extend downward, doing a couple of things: a.) providing extra shelf space on the left side for towels or bath accessories; b.) support. It's Engineering 101: creating this T-shape exponentially strengthens the counter. Those two vertical elements mount onto studs that are hidden behind the drywall. Resting the counter on top is nearly as strong as if this were a conventional floor-mounted bath vanity. Eliminate the bathroom vanity, eliminate the bulk. If you have an ultra-tiny bathroom, you don't want a big, hulking bathroom vanity. After all, when you've only got 12 square feet to play with, why devote 1/3rd of that space to a big wooden box resting on the floor? Wall-mount counters are the perfect solution for the ultra-small bathroom. They hold up the sink, provide some counter room to put your stuff, and that's it. No under-cabinet storage for the Comet (recommended: store it elsewhere). Also note: no vessel sink here. The sink is formed, seamlessly, as part of the counter. Having said all that, I'll add that wall-mounts don't really give your bathroom more space--only the illusion of space. At most, you might get a few more inches of toe-room when standing at the sink. If you can ignore that amazing all-glass sink for a minute, you'll see a bathroom counter/vanity that combines the best of both worlds. One problem with the "wafer-style" wall-mount counters we've seen elsewhere in this gallery is they have zero storage space. But this type provides some storage space on the right (accessible from the side), all while maintaining that floating-from-the-wall look. When these wall-mounted bath vanities get too big and too low, it's almost pointless to try suspending them anymore. Lovely as it is, this one isn't so much "floating" as it is "hulking." The open space at the bottom becomes a dark, shadowy area. Ominous? Maybe. Especially when you consider what kind of junk will accumulate there over time (dust bunnies, spent toilet rolls, Q-Tips, etc.). With this one, I'd just floor-mount the vanity and add a kickplate. And here it is. After all these pictures of intimidating "wafer" counters, here's one where you can screw it to the studs in minutes and be done with it. One odd fact about wall-mount vanities is that they can be easier to install than floor-mounted ones. That's because they operate independently from the floor. Got a less-than-level floor? No problem.The vanity is practically self-leveling. You'll find this type of smallish wall vanity from Wayfair in the $800 to $1,000 range, via their Amare or Senza lines. You don't even need a bathroom counter when your sink unit is big enough. This sink unit has enough basins for two people using the bathroom at the same time. The only thing lacking is some counter space. 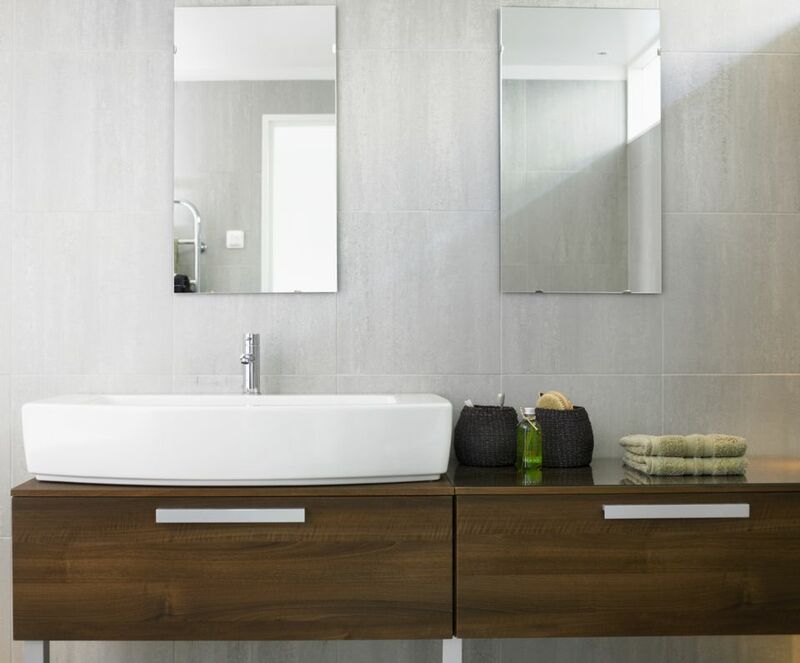 Contemporary bathrooms lend themselves well to wall-mount vanities, as well. Modern, as seen earlier, is more focused on forms, shapes, and colors to create a room that is more art than a "machine for living." Contemporary is friendlier, more "today," and is a style most homeowners can imagine themselves implementing in their homes. Here, a contemporary bathroom utilizes its long, wall-mount counter for maximum effect.